The sun is in my eyes, glaring and sparkling off the pool. 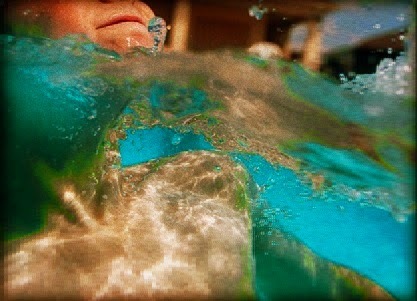 A shower of water rains on my face, created by the child drowning swimming in front of me. The tinge of chlorine tightens my squint. before her limited swimming skills fail to bring her mouth above the water for another hurried breath. She expends much needed energy to say, "No! <BREATH> I've got it!" Meanwhile, her feet and hands push and pull desperately against the water. I wait closely, tracking her progress. I don't want to offer help too soon (or too late) so I agonize over the slow drip of time between gasps. Goggles provide vision above and below. Underneath the water is cool, her hair dances slowly and rhythmically about her determined face. The sun is dampened and sound takes on new qualities as reality creeps to the edge of recognition. It really is another world under here. I am terrified. Looking for any sign of doubt or fear behind her own goggles and dreaming of the breath and the sweet chaos at the surface. Is this the way I'll feel when she is learning to drive? The first time her heart is broken? Will I be there with my hand outstretched? Will anyone? Of course she wants to be independent. She is of us, of me. Is it instinct, this characteristic of avoiding the request for help? Clearly, people everywhere need help of one kind or another yet hesitate to ask for it even when we need it most. I know I do. Did I teach her this? Is it some misguided shame in needing others causes us to act this way? Pride which misguidedly stays our hand from reaching out to others? Is it fear which causes the hesitation? Will the hand be there when I reach for it? Will it pull back too soon, leaving us no better off than when we started? Children need to learn the value of independence, but in the end my daughter, J Bean, knows I'm there and if/when she reaches out a hand to me I'll pull her up as quickly as I can. Must be a great feeling. One we should all experience. As time passes, I hope to show her the power in the hands of the world. How her mother's and mine are not the only ones ready to lift her. Eventually she'll know ours are not infinite and she'll need that reassurance. I'll need that reassurance. Her face breaks the surface just as her outstretched hands finally grasp the edge. Relief floods my mind as oxygen fills her lungs and I pull back my hand. The edge is constant. I am here. Others nearby are ready to help. I trust in the knowledge another intrinsically human characteristic is the desire to help others. People step up and offer help even when we won't ask for it ourselves. We like to help, we want to, I really believe that we need to. It seems we should be happy in giving and receiving. Help when we can, reach for a hand when we need it and know it will be there, because it will. 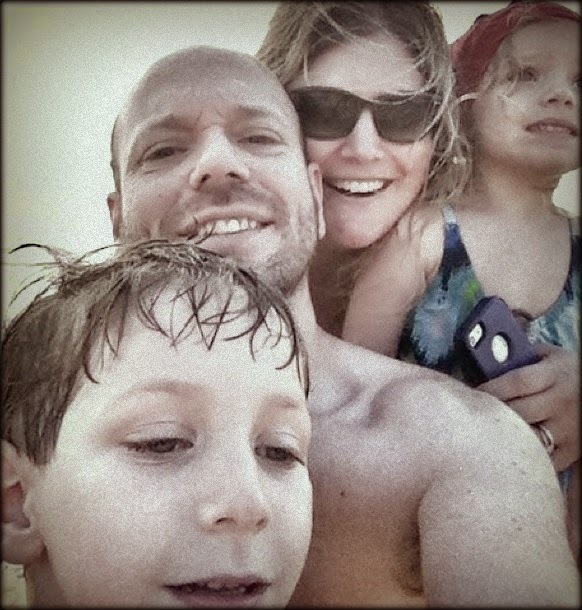 A fellow dad blogger, Oren Miller of A Father and A Blogger, reached out a hand here. He didn't realize he had actually, because all he really did was let his community know his situation and his thoughts on it. Heartbreakingly, that situation is dire. The response to Oren's stage 4 lung cancer, much to his surprise, came in the form of hundreds of outstretched hands. One stood out to me, it was the hand of Brent Almond (Designer Daddy) who created a Give Forward page for Oren so that we might send Oren and his family on a much needed and deserved vacation. Brents' action was important as it flew in the face of the bystander effect. We all wanted to do something for Oren, but we didn't know where to start. That fund surpassed our imaginations and is now, I am proud to say, a true gift to help them through the rough road ahead. I hope you'll check out the Give Forward page and consider extending a hand of your own to help this loving family through the challenge of their life. Oren, we are with you. Take a hand. Well said! One of the hardest things to do sometimes is reach out. In society, a lot of times, asking for help is seen as a sign of weakness. Oh how wrong we can be some times.